Soulless is the first book of the Parasol Protectorate series: a comedy of manners set in Victorian London, full of werewolves, vampires, dirigibles, and tea drinking. Rather tongue-in-cheek take-off on the vampire/werewolf Victorian scene. The world-building by the author is complete and very well thought out/through. Clever dialogue. Fans of Georgette Heyer/Lois McMasters Bujold/Elizabeth Peters can rejoice. The prose is simply sterling, as is the vocabulary choice--nary a stumble over the wrong word. 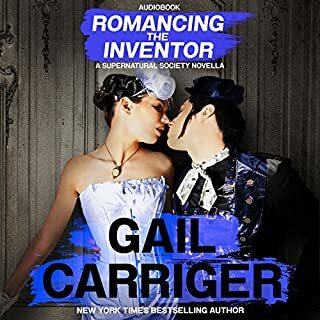 But the one thing that sends this romp over the top is the narrator: like Grover Gardner for the Vorkosigan saga and Barbara Rosenblatt for the Peabody/Emerson series, Emily Gray is absolutely perfect as ALL the characters, as well as the running commentary that sends up the alternate Victorian era. A real listening pleasure. This book was alright. Nothing really to write home about. Definitely lost time period in the conversation and remarks at time and became way too 2000teens. Some of the slips broke spell as they say. But I started reading it because I have decided to read steampunk style books and this was at the top of someone's steampunk list. I would however, suggest anyone read the His Dark Materials series by Phillip Pullman over this one if getting into steampunk. Also, the Leviathan Triligy by Scott Westerfield, and for classics do Time Machine and 20,000 Leagues Under the Sea. 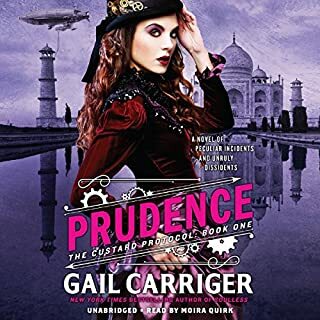 I will be reading the rest of these parasol protectorate so we will see how it goes. LOOOOOOOOOOOOOOOOOOOVED THIS BOOK. It was very funny and written so beautifully and cleverly that I found even the exposition parts to be enjoyable. 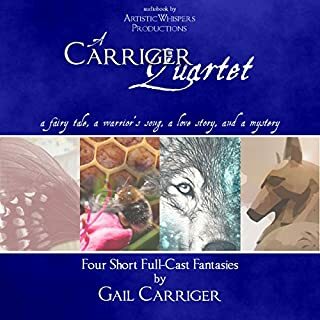 Gail did a fantastic job at world building though I would like to know if there are more supernatural creatures besides werewolves, vampires and ghosts. It is never really said if there are and there was plenty of opportunities to do so. Alexia is a very strong and relatable character who was just the right amount of awkward without it being her main appeal. 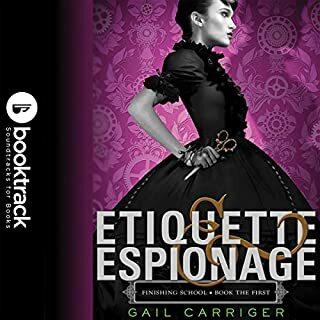 Emily did a fantastic job with the performance and gave the story life and wit, I am certain that I would have enjoyed the book a bit less if I had read it and not listened to it. My first time with the audio version. My husband and I listened together. it is a favorite of mine. we both loved it and thought it was great fun. Where did I put my fan? Seriously steamy and a great time. If you havent, please read or listen to this series! This is one of my favorite books! I’ve read it multiple times, but finally decided to try the audiobook version. I was not impressed. The reader mispronounced multiple character names, which grated on my nerves! And I didn’t always agree with her voices for the characters, especially Ivy’s. All in all, these issues detracted from my full enjoyment of the book. This book deserves so much better! Not entirely what I typically read but I enjoyed the author's storytelling with well placed humor. This series is not a literary masterpiece that will make you cry and shout and question your existence - but it will make you laugh. Out loud. I listened to this at work and got some weird looks when I couldn't stop giggling. In fact, I was so amused that I listened to the rest of the series over the next week or so, as well. Alexia is wonderful - funny, bold, sassy and humorously prim. I love a good spinster romance story, and a gruff Scottish love interest is even better. Lord Akeldama somehow endeared himself to me - even though I usually find the flamboyant gay man with a flock of young, vain lovers cheap, overly done, and a transparent/flimsy attempt to curry favor from the gay population and "trendy" hangers-on. The series as a whole almost felt like a parody of a mixed bag of other genres. There were some plot lines that I found a bit implausible, and some jokes that were downright cheesy, but that was part of the appeal. After a string of disappointing and/or heavy books, this book was refreshing. Like settling in and watching a campy, absurd, slightly British comedy after marathoning depressing historical biographies. That said, I warn you to not get discouraged by the 2nd book. It's miles below the rest in quality and will make you hate Ivy for being so stupid, and hate both the author and Alexia for constantly pointing it out. Also, I feel like Alexia develops into quite the pompous matron as the books go on; like a comedian whose humour turns mean after awhile, when running low on material. Still, the romance was fun while being not too smutty, there was plenty of action, all the main characters were quite lovable and well-developed, and Alexia herself is a unique, larger-than-life blast! I'd recommend anyone read the first book, at the very least, if you're having a bad day!